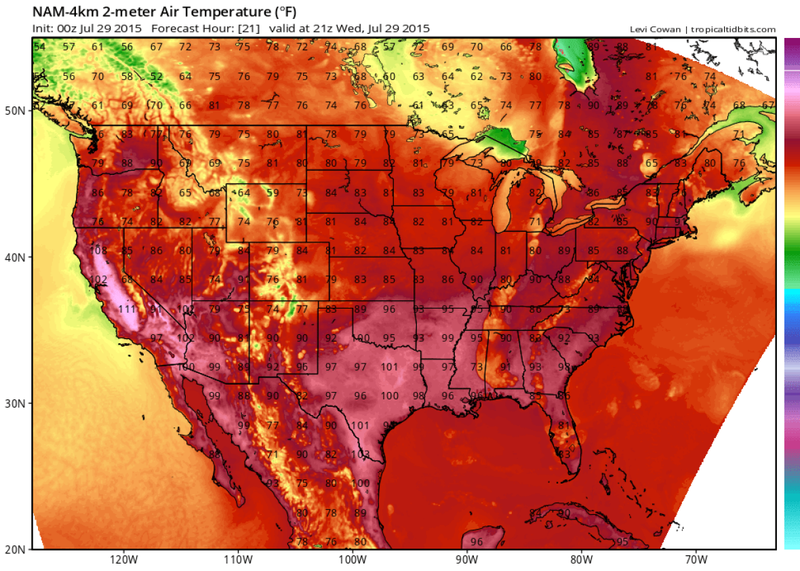 East coast heat wave: Temperatures top 90, and man is it gross out there. It’s late July, and the weather map is on fire. Those three perfectly timed words, coming from a group of meteorologists known more for their in-depth analysis, were exactly what we needed to hear on a day like today. Science! RT @capitalweather: It's gross out. I go to Cap Weather Gang for the the most thoughtful, well-articulated, scientific reports. RT @capitalweather: It’s gross out. At fault for the horrid weather, besides the fact that it’s late July, is a weird little storm system moving through southern Canada that’s pulling loads of subtropical humidity northward along the East Coast. That same swirl produced an “exceptional” summertime snowstorm in the mountains of Montana on Monday, along with 60 mph wind gusts. “This pattern should not happen in July,” wrote the National Weather Service forecaster in Billings, stating the obvious. The Capital Weather Gang’s Jason Samenow has a comprehensive look at the rarity of Monday’s snow. Fast forward two days, and parts of more than 30 states are expected to top 90 degrees on Wednesday, including New York City, Philadelphia, Washington, D.C., Boston, and much of the West Coast. Thankfully, some relief is on the way, at least in the East. Once this swirl moves out of the picture by Thursday, humidity levels will drop, alleviating that whole “gross” factor. Still, a recent analysis by Climate Central showed that in addition to more frequent heat waves, global warming is already making the air more stagnant and sultry on the hottest summer days, contributing to poor air quality. An air quality alert is in effect today for a good portion of the Northeast, from Delaware to Philadelphia to New York City to coastal Connecticut to southern Massachusetts.